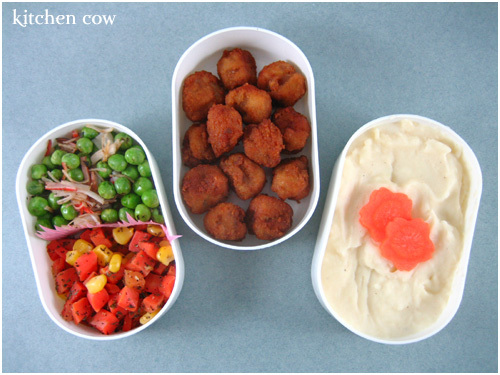 Another bento composed solely of instant food — chicken popcorn, frozen mixed veggies and instant mashed potatoes. Despite the just fry / just reheat nature of the food, when prepared correctly and paired with complementary food, it still makes for a delicious lunch. My central dish for this bento is chicken popcorn. A frozen ready-to-fry chicken dish, I prefer chicken popcorn over chicken nuggets because for me, it feels more like real chicken chunks. Local frozen chicken nuggets remind me more of minced chicken meat rather than chicken fillets so I rarely buy it. I pan-fry it frozen over medium heat with the oil level at half the chicken so I can get it golden crisp and cooked through the center without burning. The mashed potatoes are prepared instant from a powdered mix although I added more milk and butter than what the package instructed. While itâ€™s not as good as real homemade mashed potatoes, on lazy mornings when I need to rush, itâ€™s good enough to serve its purpose. Carrot flowers on top for an additional splash of color and to lessen the bland appearance of the potatoes. Finally, frozen veggies—another one of my freezer staples. Theyâ€™re perfect as an instant side, a soup filler, and a welcome addition to fried rice. I had two kinds, corn and carrots, which I reheated then sprinkled with salt, pepper, and a bit of parsley, and green peas, to which I added shredded imitation crabstick, salt and pepper. Quick, satisfying, easy to eat, and not quite as guilty as other instant food items thanks to the frozen veggies. Not a bad bento, definitely. That’s just parsley on the corn and carrots? Really looks yummy. Yeah, I love homemade mashed potatoes, too. Making that used to be a family activity for us. Everyone had to pitch in to help. I love it! They may be instant food but they’re still filling, delicious and undeniably comfort food to some. I sure want to jump into that bento of mashed potatoes. Booo! Family activity? No fair, it was always my job Even when I was in gradeschool, they made me cook it solo. That’s the thing. People usually think of instant as bad / not tasty / fake food, but it’s not. If you know how to tweak, you can still come up with something quite tasty. And the meme, you’re on. Give me this week to respond.